It was only in 2014, a.k.a. 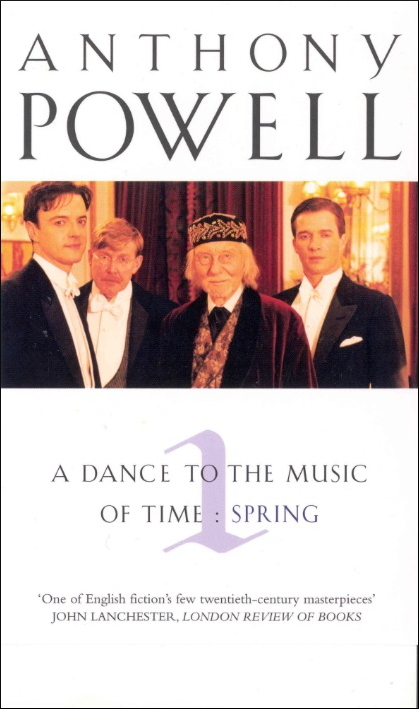 ‘My Year of Proust’, that I first heard about Anthony Powell’s twelve-volume story, A Dance to the Music of Time. After a quick glance at the book I didn’t seriously consider reading it at the time, thinking it was just a Proust imitation. But, I started to pay more attention to it and then one of the members of the GoodReads Proust group (Travelling Sunny) decided to set-up a group for a year-long read of Powell’s Dance and I got sucked in….and I’m glad that I did. I’m now half-way through volume 5, Casanova’s Chinese Restaurant and I’m enjoying the literary ride through the lives of the characters. I haven’t posted anything about these novels so far, so here goes. A Dance to the Music of Time (hereon known as Dance) is named after a painting by Nicolas Poussin (1594-1665). The novels were published between 1951 and 1975 and concern the lives of a multitude of characters, mostly English upper-class and artists, from the main characters’ schooldays in 1921 to about 1971. Comparisons with Proust abound and are not to be entirely ignored, so let’s look at them; both are large multi-volume books covering the lives of a large number of characters; the books are essentially plotless and instead follow the lives of these characters as they interact with each other; much of what we find out about the characters is from the conversations of other characters at parties, over lunch etc. ; the main characters’ backgrounds and lives are similar to the authors’ and it is possible to identify real people who can be identified with the fictionalised versions in the books – even if the authors deny this; most of the characters are upper-class or artists. And the differences? Well, the main difference is their style — Powell does not write in the style of Proust and is definitely not trying to imitate Proust in that respect. Powell’s novels are very tightly written and are a lot more humourous than Proust; we don’t get Proust’s long, tortuous, sentences, nor do we get the claustrophobic feeling associated with Proust. At times, when reading Proust, I felt as if I was trapped inside the narrator’s skull, doomed never to escape; with Powell we tend to drift around amongst the characters more and in fact we tend to learn very little of the narrator’s (Nick Jenkin’s) life. Anecdotes relating to his acknowledged oddness were also familiar; but before that moment such stories had not made him live. It was on the bleak December tarmac of that Saturday afternoon in, I suppose, the year 1921 that Widmerpool, fairly heavily built, thick lips and metal-rimmed spectacles giving his face as usual an aggrieved expression, first took coherent form in my mind. We are also introduced to Nick’s uncle, Giles, and the house-master, Le Bas, who periodically appear at later dates. In fact the third novel, The Acceptance World ends with an annual dinner hosted by Le Bas for the ‘Old Boys’ (c. 1933) in which Widmerpool bores everyone with a dry speech, Le Bas has a stroke and collapses and Stringham gets so drunk that Nick and Widmerpool have to help him home. In between these two points we get to see Nick’s visit to France as a student, his time at University, his life after University working for a publisher’s, many parties, some of the characters getting married…and then divorced, we encounter writers and artists and as we venture into the 1930s there’s the changing political landscape to contend with. Every now and then political events intrude on the characters’ lives. On most of the occasions when I visited the Ufford, halls and reception rooms were so utterly deserted that the interior might almost have been Uncle Giles’s private residence. Had he been a rich bachelor, instead of a poor one, he would probably have lived in a house of just that sort: bare: anonymous: old-fashioned: draughty: with heavy mahogany cabinets and sideboards spaced out at intervals in passages and on landings; nothing that could possibly commit him to any specific opinion, beyond general disapproval of the way the world was run. Smith’s face puckered, as if manfully attempting to force his mind to grapple with a mathematical or philosophical problem of extraordinary complexity. His bearing suggested that he had certainly before heard the word ‘champagne’ used, if only in some distant, outlandish context; that devotion to his master alone gave him some apprehension of what this question—these ravings, almost—might mean. Nothing good could come of it. This was a disastrous way to talk. That was his unspoken message so far as champagne was concerned. After a long pause, he at last shook his head. Maclintick’s calculatedly humdrum appearance, although shabby, seemed aimed at concealing bohemian affiliations. The minute circular lenses of his gold-rimmed spectacles, set across the nose of a pug dog, made one think of caricatures of Thackeray or President Thiers, imposing upon him the air of a bad-tempered doctor. Mrs Maclintick’s dissatisfaction with life had probably reached so advanced a stage that she was unable to approach any new event amiably, even when proffered temporary alleviation of her own chronic spleen. Even later, when they attend a party their bickering doesn’t cease. They’re great characters for a book but they’d be hell to live with in real life. So, after about a thousand pages I’m still fascinated with this book and I eagerly look forward to the next volume — I hope my enthusiasm will continue. Excellent piece on these books. I read the whole lot a couple of years ago, one a month, and found them fascinating! I’m reading one a month as well but I keep wanting to read the next one. They’re a lot better than I thought they’d be. I’ve never heard of these books. I will have to put them on my TBR pile. I like books that are a long series! As with Proust, you can basically think of it as a single novel. Each volume is split into four or five chapters and each chapter more or less takes place at a single point in time. Where I’m at at the moment is 1936 – the war is approaching. That’s good to hear Guy. I think you’d like it. It doesn’t feel like a mammoth read as it’s quite easy. I read Bleak House before starting this and I find both books similar in a way. Wonderful! That quote about the champagne is terrific. I really want to read these books at some point, maybe in 2 or 3 years time once I’ve worked through my Classics Club list. Glad to hear that the focus is on characterisation – I wasn’t aware of the comparisons to Proust, but I can see what you mean. 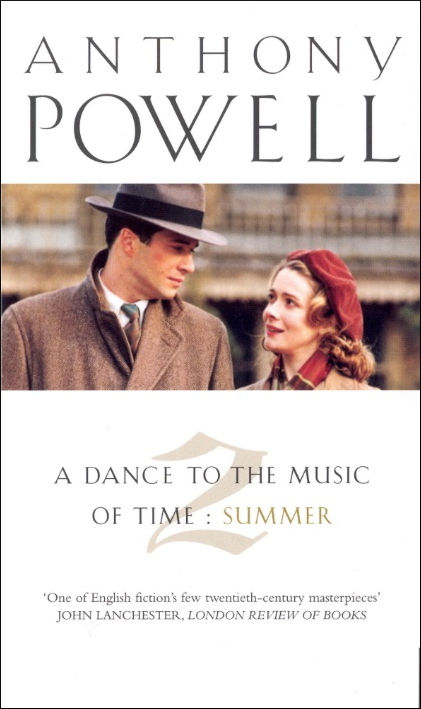 It was strange that I hadn’t heard of Powell and Dance. Now I keep seeing his books everywhere. Although it consists of twelve original volumes, it isn’t particularly heavy reading and I find myself breezing through each book. *worked my way through my Classics Club list. Wonderful post, Jonathan! I was looking forward to your post on Anthony Powell’s novel series since you told me about them. I hadn’t heard of Powell’s novel series before. It is interesting to know about the comparisons with Proust. This looks like a sprawling, mammoth epic spanning decades with lots of characters – kind of like ‘War and Peace’. I will add this to my ‘TBR’ list. Thanks for this brilliant post. Thanks Vishy. It’s well worth trying if you have the time. I’m teading one a month but I could quite easily read two a month. The books span about 50 years, so it covers a lifetime rather than generations. Nice review, and I’m glad you’re enjoying them and to find another fan. I read them as one book in two, so every second book I read was one of the sequence. Worked pretty well. I’ve reviewed them all I think at mine – avoiding spoilers for past volumes when I was writing about the final ones was one of the trickiest things I’ve done on the blog. Breezing through them is a good way to put it. They’re invididually very readable aren’t they? And such memorable characters. The only flaw I recall (other than that they are a bit snobbish, but that’s the milieu) is that Maclintock seems to come from nowhere in book four but has apparently always been one of Nick’s friends. I always wondered if Powell hadn’t thought of him previously but wanted him always to have been there anyway. It reminded me of a tv show where suddenly in season three there’s some new character that everyone acts as if they’ve always known. Still, as flaws go that’s not bad. I do get the sense it’s going out of fashion, along with many other works/writers of that period. Yes, I got the feeling that Maclintick and Moreland were added here as a flashback because he wanted to expand Nick’s circle of friends. I don’t believe that either had been mentioned before this volume. BTW I’m making use of Hilary Spurling’s handbook to keep track of the characters. It’s becoming increasingly difficult keeping track of the Tollands as there are just so many. I read the first four in this surrealist year but got waylaid at the fifth. Love Widmerpool such a brilliant character. I must get back to these soon. I’m finding that volumes 3-5 have been great and I don’t intend abandoning the series. Widmerpool’s a great character but I like a lot of the others just as much; such as Erridge, MacLintick, Mona, Umfraville, Uncle Giles etc. Even Widmerpool’s mother is a great character and we mostly only hear about her from Widmerpool.